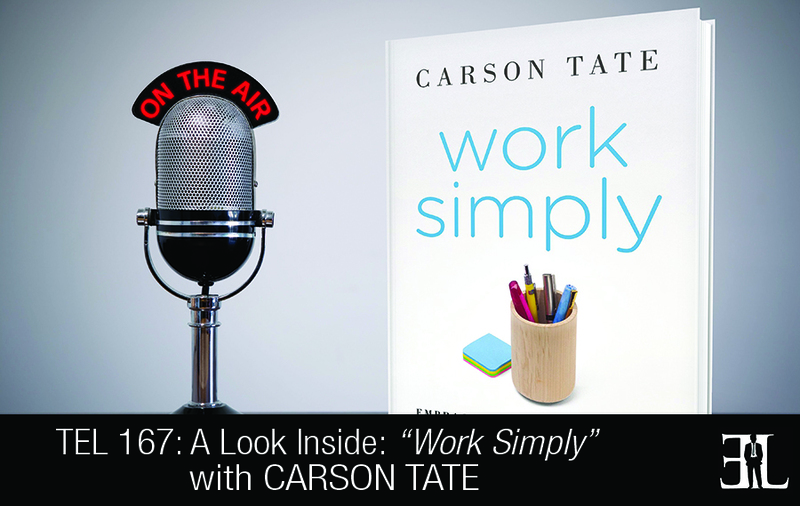 In this episode Carson Tate takes a deep dive into her book, Work Simply, where she provides a system to help make work less complicated and more organized. In her book Tate gives you a step-by-step productivity system that is separated into four custom styles that are uniquely fit for different types of learners and doers. The goal of the book is to help you identify your own unique productivity style, maximize your effectiveness, lead great meetings, communicate properly, and tell how your desk defines your work style. This book is perfect for entrepreneurs that maintain a very busy schedule, work over 40 hours a week, and need help organizing tasks into an effective system. The key difference from my book is that it is based on this concept that I developed called productivity style. In the book you take an assessment to determine your thinking style and once you discern your type then the rest of the book you customize strategies and tools based on your type. I absolutely do not recommend you read my book front to back. I would suggest that you go to the chapter or chapters in the book that speak to your current challenge and read that content. It would be to personalize your productivity. Decide to no longer accept a one size fits all solution for your time or e-mail or communication challenges. Push back and understand your thinking style and then rigorously filter and only allow in those strategies and tools that are in alignment with you and the way that you work. Early on in the book there is a chapter on your productivity style, why it matters, and how to identify it. Then the book moves into the areas that I think most of us really struggle with in our businesses. In this section there is a chapter about Managing Your Attention and in our 24/7, always connected world, how do you manage your attention so that you’re able to focus on your goals and priorities. And this chapter looks at how to control against distractions, how to manage “emergencies”, and also how to manage your technology. Then the books moves on to Setting Priorities. Everybody knows about setting priorities but I introduce a new framework here that I call Ready Goals and these goals are slightly different than most of us have been taught around Smart Goals in that they are realistic, exciting, action oriented, directive, and ultimately they are yours. Next I look very specifically at the challenge we face like investing your time wisely, how to free your brain and build an effective master task list, how to get more done, and then how to tame your inbox. And then we move into how to shape your space. How do you shape your physical environment regardless of where you work for optimal performance? Each of the sections start with best practices and each one have very specific strategies for you based on your productivity style. Each chapter also has very detailed charts that make it very easy to access the information and most of them are downloadable from the website. In the third part of the book we talk about how to work more effectively with others. This section looks at how to delegate effectively and gives you charts on productivity style clues so that you can identify the style of your direct reports, the style of your investors and vendors. Then there is a section on working well with others and why we have what I call these productivity clashes and what to do about them. And the finally piece in this section is around meetings and how to get work done in and through them. I end the book with a high level summary so that you can pull out the nuggets and take away what you want. I am the owner and founder of a company called Working Simply and that’s my personal mission as well as my company’s mission to help individuals, teams, and organizations streamline and simplify their workflow. I am very privileged to have the opportunity to work with really high achieving entrepreneurs and business owners and as I was working with them I was finding that they were struggling in trying to adopt and adapt some of the time management, productivity, best practices in the marketplace. So they were feeling frustrated and overwhelmed because the latest and greatest app or blog post that they read wasn’t working for them. I realized that it wasn’t the lack of drive but rather the tools that they were using weren’t aligned to the way they think. So I wanted to write a book that helped people identify the way they think and then align their thinking styles to the way they actually work so that they can be more productive and more discerning.